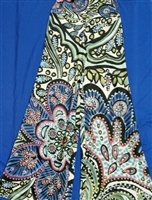 These lovely Palazzo Pants are made with 90% Rayon / 10% Spandex. The sizes run "one size smaller" so when ordering...order one size larger. We do make these in larger sizes if needed, just email us or call us and we can place a special order in for your size. Care of garment info: Machine wash in cold water, hand dry. Palazzo Pants- "Color Me Beautiful"
Palazzo Pants "Groovy Kind of Love"
These lovely Palazzo Pants are made with 90% Rayon & 10% Spandex. The sizes run "one size smaller" so when ordering...order one size larger. We do make these in "longer" sizes if you are tall. Just email us or call us and we can place a special order in for your size. Care of garment info: Machine wash in cold water, hand dry. You can easily pair these pants with a Raglan 3/4 sleeve top or wear them with a Cold Shoulder Top too.